This morning, the campers awoke with an unusual bittersweet feeling, knowing today would be their last day of activities. The campers have accomplished so much and made so many memories during their time here. However, rather than dwelling on all the fun they’ve had so far, the campers eagerly went out to have another great day at camp. Tonight their efforts will be rewarded at the Final Campfire where we will honor campers for their investment in camp and remember the great times we have had here during these two weeks. During the day, campers strove to make the most of their remaining time at camp by earning bars in activities and mastering the skills they have been working on. In the morning, Mauricio L, John H, James B, and Will L earned their bronze bars in archery. During team sports, Cole L and Quentin S received their bronze bars, Will H, Luke P, Adam V, and Daniel V earned their silvers, and Jake L and Mauricio L earned their gold bars. We had an unprecedented day in Tennis as Alex R, Gavin G, Cole L, Cody S, Collins Morgan, and Will H all earned their gold bars in Tennis. In Swimming Reid F and Daniel V earned their bronzes. 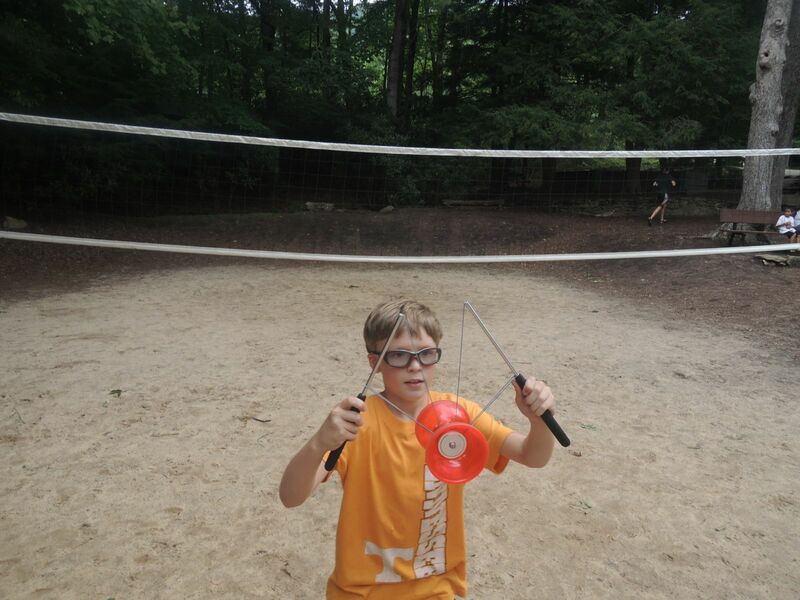 During free time, Morris D hosted a fencing tournament to earn his gold bar. In this tournament, John H also earned his gold bar by completing his final requirement of earning second place or higher in a tournament. Having campers who strive to invest in camp as you’ve seen here is what makes final campfire so meaningful. Tonight’s Final Campfire is one of the most heartfelt experiences we have here at Camp Timberlake, because it gives an opportunity to remember the time we’ve had at camp and thank the campers who make camp the amazing place it is. During the ceremony, we award campers who seek to serve their fellow campers and act as leaders in the cabin with commendations. Both campers and counselors vote for campers to receive commendations. Recipients place their hand in the paint of their tribal colors then leave handprint on the standard in the council ring symbolic of the mark they have left on camp. Once all the cabins have handed out their commendations, the ceremony moves on to award promotions towards the rank of Little Chief, the highest honor any camper can receive. Campers receive promotions through earning marks from bars in activities, commendations, or electives such as running the Tomahawk Trail. When each promotion is given out, the campers will walk towards the center of the council ring then the counselors will be join by the campers to do a morning yell to celebrate the campers’ achievements. After the awarding of promotions, the last year Greybeard campers will give a short speech regarding their time at camp and giving advice to younger campers. Gavin G and Will S gave terrific speeches. After the speeches, the staff shared memories made throughout the session with the campers. For the final part of Final Campfire, the whole camp joined in a circle and sang the Camp Hymn for the last time this year. After Final Campfire, we all went to Spencer’s Green for Commando, the greatest water balloon war of camp. When Commando is over, the boys will return to the cabins to pack up and get ready for closing ceremonies tomorrow. We’re excited for closing ceremonies, but sad to see these campers go. We’ve had an amazing time with them and can’t for them to be back next year. A Record DayWelcome to 3A!